Rebecca Clair of Salt Spring Island passed away peacefully at her home on February 4th. 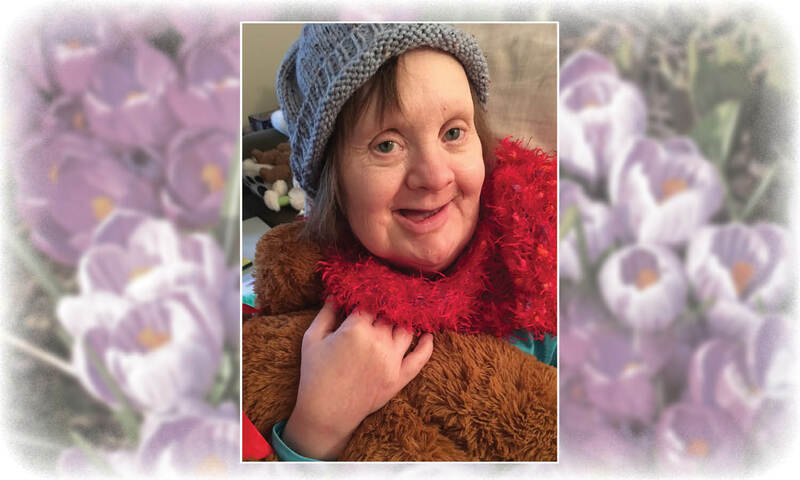 Becky, affectionately known as Boo was born with down’s and lived a vibrant, radiant and fully expressive life. Her instinctual ability for empathy, was beyond measure. Just knowing the right moment for a hug or a rub on your back along with a reassuring, ahhhh. As teacher she lead by example, how to be in the moment, to love life, to forgive, cherish friendship, laugh, sing, dance and just be silly. Her delicious enjoyment for chocolate cake and french fries could be infectious. Yet it was her beautiful smile, twinkling eyes and “those cheeks” that would melt hearts. She will be forever missed by her adoring sister and her remarkably amazing community family. Let her be embraced and lifted up into the circle of friends and family that have gone before where she can continue to be that enduring bright light for us all.